So I'm finally getting around to starting a new section of my blog: Tips & Tricks. This will kind of be like a "Cooking 101" class combined with posts about time and money savers in the kitchen. You'll find the Tips & Tricks link at the top of the page, next to the Recipe Index. Today I wanted to share something I picked up from my mother-in-law. You know all those recipes that call for browned ground beef or cooked chicken? How many times does that mean you have to defrost a pound of raw ground beef, then cook it up, or defrost some frozen chicken breasts, cook them, then shred or chop - all before you can get started on your recipe? I did that for years. Until my mother-in-law introduced me to a better way. Pre-cooking large batches, THEN freezing! And not only does this save you time by getting it all done at once, it saves you time with defrosting as well. 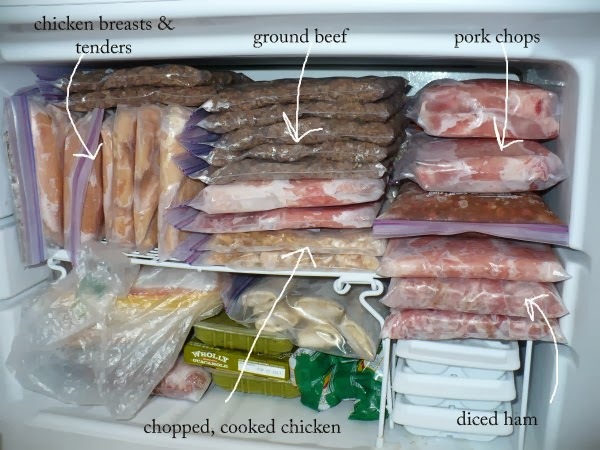 Cooked ground beef and chicken have a lot less water content than raw and defrosts in a fraction of the time. 1. Buy the ground beef or chicken when it goes on sale. The last time I did this I bought 6 pounds of 95% lean ground beef for $2.77/lb (best price I can get in Phoenix). 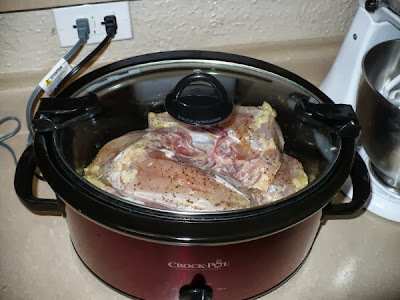 When it comes to chicken, sometimes I can get bone-in split chicken breasts for as little as $0.88/lb. (but that is rare). Most of the time I get boneless, skinless chicken breasts for about $1.67/lb. It can just barely hold the 6 pounds! If you have to, do multiple batches. It can take time and patience, but it WILL brown. Once it does, drain it and let it cool. You don't want to put hot beef in the freezer - ice crystals will form from the trapped steam and cause freezer burn. At this point, the meat just falls off the bone. I like to chop my chicken, but if you prefer to shred it, go for it. 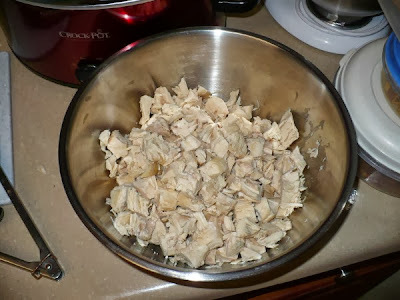 If you want another shortcut, you can shred the chicken in a stand mixer. I like to add about 1/4 - 1/2 cup of the broth back into the chopped chicken. It adds flavor and keeps the chicken moist. You can reserve the rest of the broth and put it in the fridge. Once the fat solidifies at the top, you can scoop it off and then freeze the broth for future use. You can label them if you want, but it's not hard to guess what's in there. If you are worried about using it in time, you can certainly add the date it was cooked. 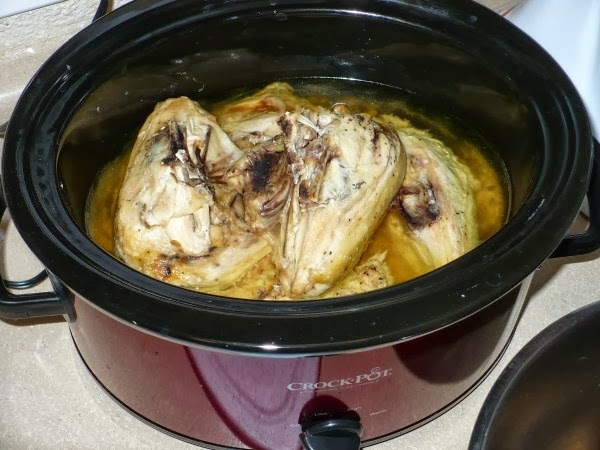 This can help if you end up doing another batch before using up what's left in the freezer. Believe it or not, there's more stuff behind what you can see. I'm all about organization in there (not necessarily in the rest of my house...). As you can see on the left, once something is frozen flat, you can stack it vertically! It's a lot easier to pull things out when they are stored this way - less risk of dropping frozen food on your foot. The ground beef wasn't frozen yet, so I set some already frozen bags down for the beef to rest on until it froze. Then I could rearrange it vertically again. Obviously there are other things in there besides the cooked chicken and beef, but we'll get to those in another post. As I mentioned before, you want to use it up within 6 months. 5. Defrost it and use it! 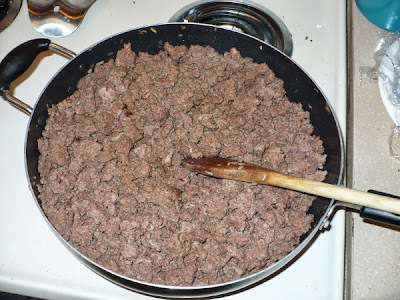 Now that your ground beef and chicken are cooked, you have them ready whenever they are called for in a recipe. Just defrost it in the microwave - I promise, it only takes a couple of minutes at most. Sometimes I don't even bother defrosting it - I just plop the frozen ground beef in my spaghetti sauce and let the stove do the work. I'm a tall girl too! 6'2". 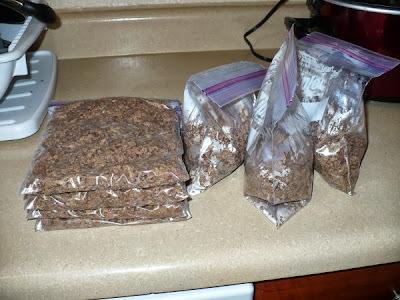 Anyway I did what you do and cooked a big batch of ground beef a couple weeks ago, put it into 1lb bags and froze in my deep freezer. So today I took a bag out, partially defrosted in micro and then finished defrosting in my sauce. I was making a Johnny Marzetti casserole - but I ended up having enough to do two. So I'm wondering - now that I cooked, bagged, froze, thawed, cooked, can I freeze again???? I love your way that at first cooked beef or meat and then chopped it, after that freeze it. It's really a good way to save time and money both. I will also try it. Most of the people generally use corned beef (beef cured with salt) to keep it safe for a long time. Corned beef is also a good way. Another way that I have learned about beef aging process is with Himalayan salt. You can see this video http://cornstorecork.com/2014/01/learn-all-about-our-beef-ageing-process/ to know more about beef aging process. Sorry it took me so long to respond! I've had a crazy winter/spring involving a move and am just now getting back to my blog. For the future, if you use the ground beef to make a spaghetti sauce or chili or whatever and end up with leftovers, you can certainly freeze the extra chili or sauce - I do it all the time. 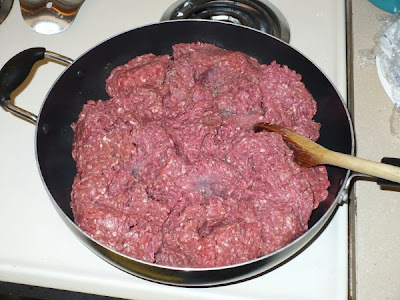 I don't recommend, however, thawing the ground beef, only using part of it and then refreezing what you don't use. Does that make sense? I can't vouch for the food safety and texture if you refreeze it.